After being a member here for the better part of a year I decided that I would introduce my tank to everyone. i use PB too, there is a couple of really easy ways to post pics from there ( probably more but these are what i use ). 1) left click on the data next to 'IMG code' and it will automatically be copied, then just paste it in the message. 2) left click on the data next to 'Direct Link' and use the 'insert image' button found on the right side of the tool bar right above the editor window, then paste the info there. the clown tang is going to be pretty aggressive and will grow pretty large, ( the sailfin will get large too ) up to about 1' in length. 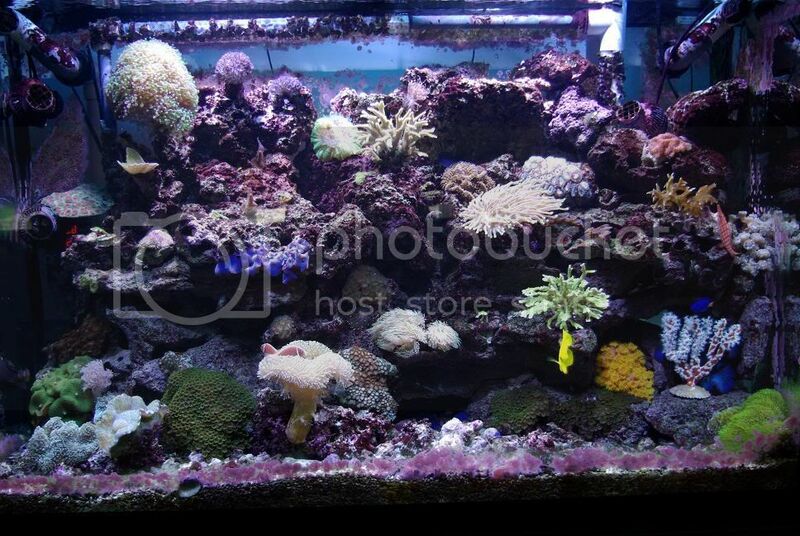 the tank looks awesome, how old is your system?? how do you like having it in your bedroom?, i used to think the noise would drive me crazy but now i feel better when i can hear the water. the kole and the clown in my tank are best buddies. those are some of my favorites.. just awesome personality! Love those sun polyps on the bottom! First let me thank you for fixing up the image for me, I was getting quite confused. realize that the two tangs are going to get too big for my tank (thats what the classifieds here are for right), right now though they are nicely sized at 2-3 inches or so. I'm hoping to pacify the clown tang by keeping him in isolation for a bit (been about a month now) and then reintroducing him as the last fish (if not then he may end up in the classifieds sooner than expected). I feel the same way that you do about the tank in the bedroom, I find the sound of running water to be very calming at night (not to mention the sight when the moonlights are on). I would like to know though if theres any one else here that likes to keep their substrate covered in debris like I do? In my opinion it makes the substrate more interesting to look at and gives the fish/hermits/stars something to sort through looking for pods which I find amusing. Thanks Liv, funny thing is the Kole and Clown are the two I had troubles with which is why I removed the clown for the time being. Now that the Kole has his blades (they weren't noticable until yesterday, do they grow in or are my observations way off?) I'm sure the clown will respect him a bit more though. The sun polyps have been a challenge to feed with one heck of a gluttonous sailfin tang who thinks of it as an all you can eat breakfast bar. The tank is looking good. Just a quick update, the clown tang is back in the main display and so far seems to be leaving everyone alone. Better yet the other tangs don't seem to care much that he is in there. Actually I haven't seen him in a few hours...arghh where are you you little bugger? I'm sure he'll pop out sometime tonight once he settles ... I hope. And I'm currently watching a hermit size up a new shell which happens to have a few small purple shrooms growing on it, would be neat to see my coral walking around the tank. Now if only I can convince him to take the shell covered in green star polyps. Great set up. I plan on having a yellow-eye Kole in my tank and have been wondering what other than to put with him. Most people suggest a yellow tang, but I'd rather something a bit more exotic.